Mitsubishi Shipbuilding Co., Ltd. (Mitsubishi Shipbuilding) and Mitsubishi Hitachi Power Systems, Ltd. (MHPS) signed a collaboration framework agreement with COSCO Shipping Heavy Industry (Dalian) Co., Ltd. (CHI Dalian) - one of group companies of COSCO Shipping Heavy Industry Co., Ltd. (CHI), a state-owned Chinese shipbuilder based in Shanghai - on manufacturing and marketing rectangular sulfur-oxide (SOx) scrubbers. The scrubber which was developed by those two MHI Group companies features a rectangular shape that realizes superior space saving essential for onboard installations. Based on the newly signed collaborative framework agreement, Mitsubishi Shipbuilding and MHPS with CHI Dalian will start providing the rectangular scrubber of high reliability in all processes from design and manufacture to installation onboard, so that the collaborative relationship will contribute to customer convenience. 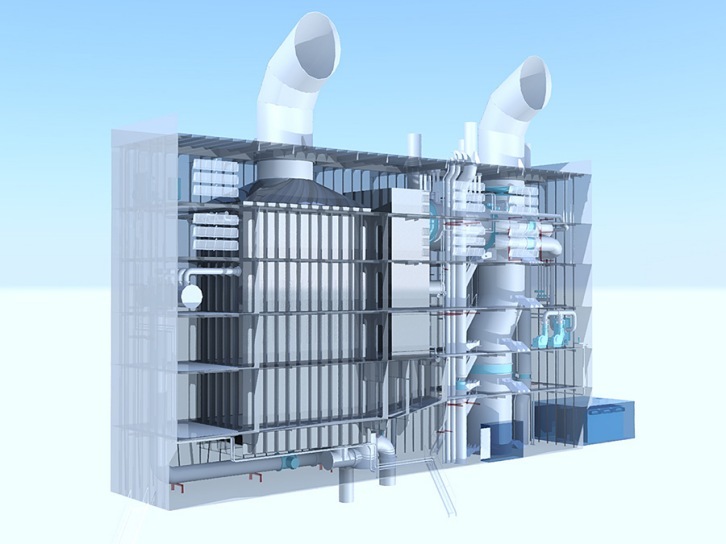 The rectangular SOx scrubber was developed for marine use by combining MHPS' comprehensive exhaust gas treatment technologies, cultivated through its exhaust gas desulfurization systems for thermal power plants, with Mitsubishi Shipbuilding's marine engineering expertise. By installing the desulfurization system, with its strong track record, efficiently within the limited space available on a ship, the amount of SO2 contained in the vessel's exhaust gas when using conventional 3.5% sulfur-content fuel can be reduced to a level that conforms to the new emissions regulations coming into effect worldwide in 2020. Under the agreement, CHI Dalian will manufacture, assemble and deliver the SOx scrubbers and install them on ships. Among the various companies under the COSCO Group - owner / operator of the world's biggest fleet - CHI is China's largest shiprepair yards and CHI Dalian has been especially gained a high reputation in the industry with its marine and offshore products. Going forward, through their close ties with CHI Dalian, Mitsubishi Shipbuilding and MHPS will ramp up sales activities of the space-saving, high-reliability rectangular scrubbers. Rectangular SOx Scrubber. Image by Mitsubishi Heavy Industries, Ltd.